The Boys are in the shop working on a new record! Here is a sneak peak of one of the tunes in the works, called ‘Follow me to Hollow’. Big thanks to the man, D.A.! 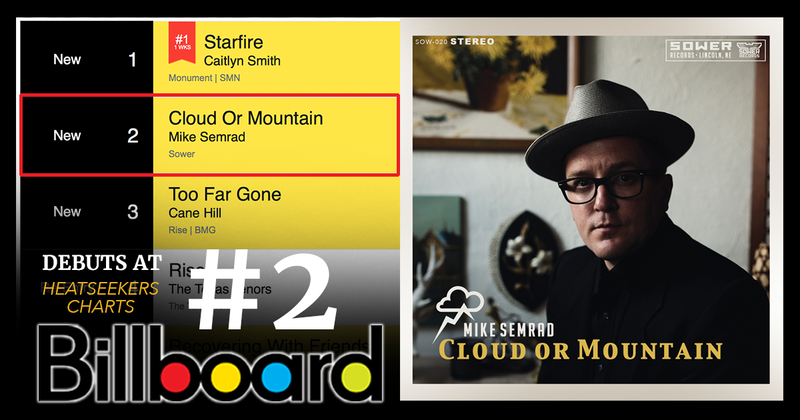 Mike Semrad’s Cloud or Mountain debut’s at #2 on the Billboard Heatseekers Charts! The new Mike Semrad album ‘Cloud or Mountain’ has debuted at #2 on the Billboard Charts as of the week of February 21st, 2018. The album has been getting some rave reviews throughout the midwest and through the plains area and it sets Mike Semrad to tour later this year. The album opener ‘What if Baby’ sets the tone, if not quite the sound, for much of what follows, which is a spiral of stories and beautiful melodies that takes the listener on a story-driven trip. The opening number is curiously followed by the dark, hopeful cry of Greg Grey Cloud, a Nebraska Ponca Indian tribal leader. His accompanying Mike Semrad on ‘Trail of Tears’, leaves you yearning for the characters in the story and paints a perfect picture of musical collaboration. Semrad’s pen doesn’t hold back on the heartache – “Mama you’ll never be the same / You’ll never see them grow”, written in the song ‘So Young and So Kind’ goes deep into a personal cancer victims tale – yet the overwhelming sentiment isn’t forced or unconvincing. The song leaves a hopeful acceptance that some things are meant to die, but will live on forever in memory. It’s a wisdom that comes from having lived these stories or perhaps the characters being “real” that makes this album so good. ‘The Ballad of Leslie Arnold’ was influenced by a story read from an Omaha World Herald article by Henry Cordes. The story took Cordes over two decades to write, with Semrad’s song being directly influenced by the 4-part suspense saga in September of 17′. It is thought to believe that Leslie Arnold, the Omaha, Nebraska murderer is still alive and is the only successful escapee from the Nebraska State Penitentiary. The title-track, ‘Cloud or Mountain’ stands up next to some of Semrad’s finest material, representing a clear highlight alongside the sombre, late-album gem ‘Answers in the River’. The jumpy, yet dark tunes ‘I don’t Mind this Time’ and ‘Through the Darkness’ are numbers that come the closest to Semrad’s usual bubbly sing-alongs. While the muddy blues murder ballad of ‘Billy Bob’ offers a tail of revenge and mischief. Cloud or Mountain is the sound of Mike Semrad placing himself amongst music’s most revered songwriters. If you’ve not had the patience or time to commit to an album of his in the past, there has not been a better time to do so. This is an album that delivers more and more with every listen, showcasing an artist maturing with grace and poise. Buy ‘Cloud or Mountain’ Now!